Get everything you need for a great sounding home theater speaker setup in a single box! You get four satellite speakers and a center channel speaker for the mid- and high-range audio signals, plus an 8-Inch powered subwoofer to handle the low frequencies. All the speakers come with an attractive black finish and convenient spring-loaded signal connectors. The center speakers use two 3-Inch shielded mid-range cones, while the satellites employ one 3-Inch cone and a 1/2-Inch dome tweeter. However, don't let the small size fool you! 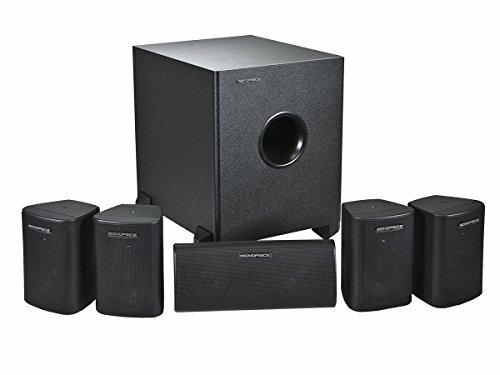 These 8 ohm speakers will handle up to 125 watts of power from your home theater receiver at frequencies from 150 Hz to 20 kHz. The subwoofer is powered by a 60 watt (RMS) amplifier, driving a downward firing 8-Inch cone. It can take either line or speaker-level inputs, so can be used with any amplifier, even older amps without dedicated subwoofer outputs. The subwoofer handles frequencies between 50 Hz to 250 Hz and includes adjustable crossover frequency and volume balance controls. Also included in the box are four C brackets for mounting the satellite speakers to the wall and the necessary hardware for mounting the speakers to the brackets. A pair of plastic feet to properly orient the face of the center speaker is also included. Note that you will need to provide your own hardware for mounting the C brackets to the wall or other vertical surface. Don't let the low price fool you! This speaker system sounds great and will fill your room with high-quality, full-spectrum sound! Note: The speaker wire connectors on each unit comfortably accept a maximum 16 gauge speaker wire. For best results use pin-type speaker plugs to make the speaker connections and banana or pin-type plugs to connect the wires to your amplifier.